It was only a matter of time: After adding support for 4K content back in December, Google Play Movies now supports HDR footage as well. If you’re not familiar, HDR (High Dynamic Range) video essentially improves color reproduction and contrast in videos. It’s arguably a more noticeable improvement than the jump from 1080P to 4K, as not everyone can see an increase in resolution but greater brightness and better colors are pretty obvious. 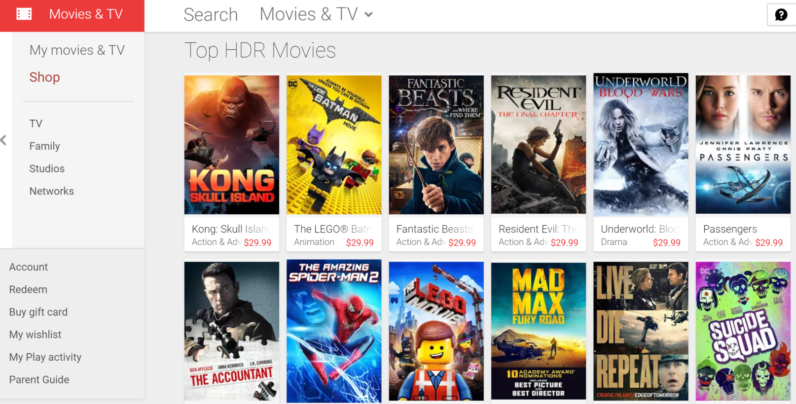 Thankfully, Google doesn’t seem to have increased pricing for HDR content – titles are priced the same as 4K movies. The update gives Google Play Movies a bit of an edge on rivals. Some competitors like Amazon and Netflix have HDR titles, but those are usually limited to exclusive original content rather than big name movies. If you want some of the best video quality available but don’t want to deal with the inconvenience of Blu Ray. Not that streaming video is Blu Ray quality, but it Google Play Movies is getting closer. Meanwhile, Apple hasn’t even added support for 4K resolution yet, let alone HDR. Granted, you’ll need an HDR-enabled display to take advantage of the feature, but most 4K TVs released in the past two years should be good to go. There are also a number of phones and tablets (the LG G6, Samsung S8, and Tab S3 come to mind) that support HDR, but it’s not clear if Google will display HDR content on these devices just yet. It’s also not clear whether Google is using HDR10 or Dolby Vision technology (though the Chromecast Ultra supports both). We’ve contacted Google for more information and will update this post if we hear back. In the mean time, you can just type “HDR” into Google Play movies to see current compatible content.